A devout Christian businessman innovated the concept of credit reporting, changing forever how business was done. Lewis Tappan created the first viable credit reporting service in America. He was born in Northampton, Massachusetts in 1788 and became a merchant, first in Philadelphia, then in Boston. A strict Calvinist, he insisted on cash transactions, since the Bible warned against lending money and charging interest. Lewis made money then lost it, going bankrupt from poorly timed investments in woolen and cotton mills. In 1827, he started over, joining his successful brother, Arthur, in New York's silk trade. The brothers were evangelically religious, and staunch moralists, contributing profits from their business to moral crusades. They gave away Bibles, blew the whistle on gaming houses, and even entered New York's brothels, "to pluck fallen women from roaring lions who seek to devour them." They connected with other activist Christians who shared reports on immoral activities and aggressively sought to enforce Christian behavior. In 1830, the Tappans met a young abolitionist agitator named William Lloyd Garrison, whom Arthur offered financial support. Soon, the brothers were part of a nationwide network opposing slavery. Their new crusade made them the hated targets of many merchants and white laborers, who believed ending slavery would destroy the cotton export business and allow freed slaves to take scarce jobs. By 1834, mobs were storming Lewis' home and Arthur's store. Faced with a boycott and lost business, the Tappans were forced to extend credit for the first time. Then, in the panic of 1837, the business was wiped out. By 1839, Arthur had repaid all his creditors and the business was shakily back on its feet. Lewis hated credit, but he realized offering it to customers was becoming the only way to make a sale. How could a merchant gauge his customer's trustworthiness, and assess whether he'd ever get paid? Tappan began keeping files on customers, reviewing their characters and their credit-worthiness. Pretty soon, other merchants were turning to Tappan for advice. Exploiting his abolitionist connections across the country, Tappan created a network of correspondents to offer up-to-date and comprehensive credit information about people in their communities. Some saw the files kept by Tappan's Mercantile Agency, founded in 1841, as an invasion of privacy. But by 1844 the business had 280 clients. It opened branch offices in Boston, Philadelphia, and Baltimore. Tappan transferred the running of the agency to his chief clerk, Benjamin Douglass, in 1849. By 1851, 2000 full-time correspondents were reporting from across the nation. 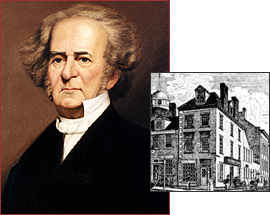 Douglass would transfer the company to his brother-in-law, Robert Graham Dun, in 1858, and in 1933 R.G. Dun & Company would merge with its main rival, Bradstreet, forming Dun & Bradstreet, the largest credit reporting entity in the world. As for Tappan, he retired wealthy to spend all his time opposing slavery. He died in 1873, a decade after the Emancipation Proclamation, in Brooklyn, New York.